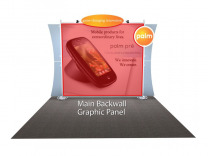 Sacagawea Replacement Graphics The ability to purchase replacement graphics for your trade show display investment is of paramount importance, and with Sacagawea you not only get quality, but also a tremendeous dollar value in comparison with other exhibit systems. So, take a look at the value you have with Sacagawea and keep your message fresh and within budget! 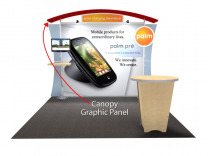 Adapting to changing market conditions is what every great trade show exhibit supplier must do, and Classic Exhibits, to the delight of their trade show display distributor network, has proven their ability to accomplish just that. What steps did they take to achieve success during a time where not a lot of new innovation was being introduced in the trade show industry? They happen to notice that certain aluminum shapes that they'd been purchasing at that time, had a very low cost per linear foot as opposed to others, and concluded that those extrusions should first be taken into account for future product development. 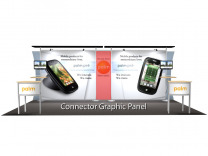 Their ingenuity and resourcefulness have produced several entire series of custom modular hybrid displays and given the market something new to look at. 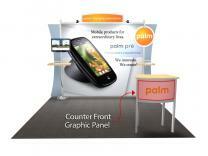 Classic developed and patented the Perfect 10 custom modular hybrid display system, plus the Sacagawea and Magellan Miracle tension fabric displays. As a result of all the great new exhibit lines that Classic has to offer, it’s no surprise that Classic maintains a leadership position in the market with their group of distributors, and appears not to be letting up one bit as they march into the future! 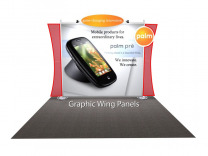 In the warp speed world of on line trade show display merchandising, you can differentiate your business by bringing your focus down to the personal level and truly try and interact with clients. It's not acceptable to take an order, pull it, and get it out the door via any of the automated means of distribution that we have access to today Even though time sometimes gets a little short, we have to be ready to take a step back and take the time to walk our clients through their purchases, which will create the kind of relationship that will eventually bring them back over and over. At ShopForExhibits, we're proud to have the qualified individuals on staff to truly offer objective advise, and allow our clients to benefit from it.